The U.S. Food and Drug Administration’s (FDA) reporting for import refusals in March indicates that 5 out of the 135 (3.7%) total seafood entry line refusals were of shrimp for reasons related to banned antibiotics. 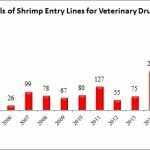 · Savvy Seafood Inc. (China), a company that has been exempted from Import Alert 16-131 since November 2014, had one entry line refused for breaded shrimp contaminated with veterinary drug residues by the Division of West Coast Imports on March 28, 2018 based on the agency’s own sample analysis. Also in March, the FDA reported refusing another eleven (11) shrimp entry lines because of salmonella, with all of these shipments originating in India. In January, the FDA reported refusing fourteen (14) shrimp entry lines because of salmonella, of which eleven (11) were attributed to Jagadeesh Marine Exports and were refused by the Division of Northeast Imports. In February, the FDA reported refusing another eleven (11) shrimp entry lines because of salmonella, of which nine (9) were from Jagadeesh Marine Exports, this time all refused by the Division of Southeast Imports. Last month, the FDA refused ten (10) entry lines of shrimp from the Indian exporter Falcon Marine Exports Pvt. Ltd. because of salmonella, this time all refused by the Division of West Coast Imports. In addition, the FDA’s Division of Southeast Imports also reported refusing a shrimp entry line from the Indian exporter Vasai Frozen Food Co. for salmonella. 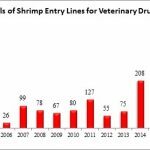 Through the first quarter of this year, the FDA has already refused 36 entry lines of shrimp for salmonella – virtually all originating from India. 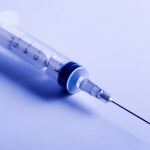 These refusals have been made at multiple ports throughout the country, encompassing the FDA’s Divisions of West Coast, Northeast, and Southeast Imports.